embee and son embee & son Kitchen Remodel Archives - embee and son . When embee & son says “we have the knowledge and know-how to make your dreams become reality”, we mean it! The talented design staff can work with any remodel project small to large, and with just about any budget. And our installers are the best there is. Wrap all this up and you have one great experience. The photos below document how the project progressed from day 1 tear out to final finished remodel. Quartz Countertops from Embee & Son, Inc. Granite Countertops from Embee & Son, Inc.
Wood Countertops from Embee & Son, Inc.
Appliances available from Embee & Son Inc.
You are invited to visit our expert staff in our showroom in York, PA to see all we have to offer from custom design … to build & installation … to completion. We can show you our solid surface countertop options including quartz countertops, granite countertops, and silestone countertops from HanStone, Silestone, Cambria, Zodiaq, CaeserStone, and Formica Stone. We also can show you our cabinetry options including Aristokraft and Mid Continent. We have flooring samples of carpet, laminate, hardwood, vinyl, luxury vinyl tile, stone, ceramic and porcelain tile from major name brands such as Shaw, Mannington, Armstrong, daltile, Scandian, and Bruce Hardwood. All of our flooring is installed by experienced flooring installers to ensure your satisfaction. Our expert craftsmen and installers have years of experience in remodeling so you can feel confident your project will be done right. embee & son is the premier retailer in kitchen remodeling, bath remodeling, flooring, cabinetry, countertops, and home fashions in York, PA and South Central, PA. In my last post, I talked about why creating contrast with your finish selections is important and showed an example of a kitchen that successfully balanced medium and dark tones with white painted cabinetry. This time, I’m going to focus on creating contrast in kitchen design that uses medium and dark tone wood cabinetry! countertops and walls. Then, to bridge the high contrast, they introduced warm, medium tones in the backsplash and flooring. and lighter countertops help to balance all of the wood and the dark slate backsplash creates a contrasting focal point. The dark finish of the cabinetry and lighting hardware help to tie it all together. that you would need to balance this design perfectly. bit for your kitchen remodel. Using any one of the four formulas I’ve shown you and you are guaranteed to have a beautiful, balanced kitchen. 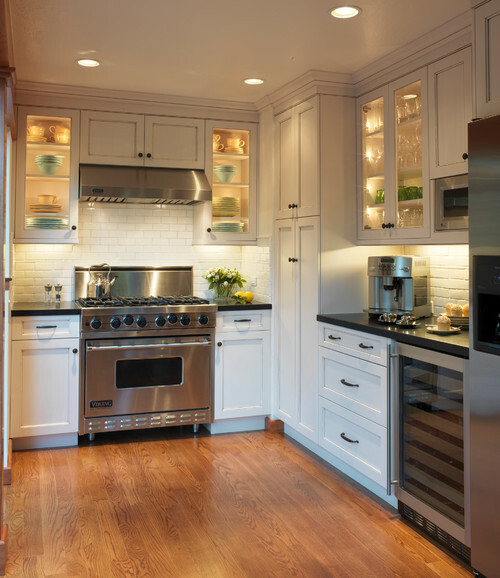 Designing your dream kitchen can be an overwhelming task. finish? What type of flooring? What paint color? …The list goes on and on. For many homeowners, this portion of the remodel process can be very frustrating. You may know the look and feel you want your kitchen to have, but are unsure of how to achieve that. Many homeowners’ first inclination is to “play it safe” and choose materials that are similar in color, like shades of beige to go with a medium wood tone cabinetry. While it’s true that the elements of this design will “match”, the overall effect will be a monotone kitchen where all the finishes blend together. how important contrast is in a kitchen design. The best kitchen designs have a balance of light tones, medium tones and dark tones, no matter what shade your cabinetry is. Here is an example of how to create contrast if you are choosing white cabinetry for your kitchen remodel with embee & son. hardware. The overall effect is still light and airy feeling, but also grounded and balanced. go wrong! In my next post, I will show you how to incorporate contrast if you are choosing medium and dark wood tone cabinetry for your kitchen remodel! here, not only to create the best layout for the functionality of your kitchen, but also to guide you through the selections process to ensure that your end product is well-designed AND beautiful! Finding your personal kitchen style is often times best discovered through photos instead of words. A photo can evoke strong feelings towards like and dislike, helping you to know which kitchen style is an expression of you. You’ll know it when you see it, as the old saying goes. In this post we will show you some kitchen styles from the kitchen remodeling portfolio from embee & son, inc.
finishes. The original wood floor, exposed beams, and brick fireplace add to the character & charm creating that warm & inviting atmosphere. These kitchens ooze with simplicity dating back to earlier times. It harkens to a lifestyle of simple & easy living. This kitchen displays the period details that are the key to a 1930’s stone cottage kitchen. It incorporates a farmhouse sink, inset doors, white subway tile, and furniture details that create a simple and functional design in a small space. Octagon tile flooring emulates materials from the original era. These kitchens tend to follow a form that is more whimsical in respect to finishes and the forms it follows. They are clean, uncluttered, and simple while all the while remaining invitingly livable. This kitchen uses clean lines, simple detail, and an iridescent tile backsplash. The stone tile floor adds warmth keeping the space from being viewed as sterile. This kitchen is also contemporary. 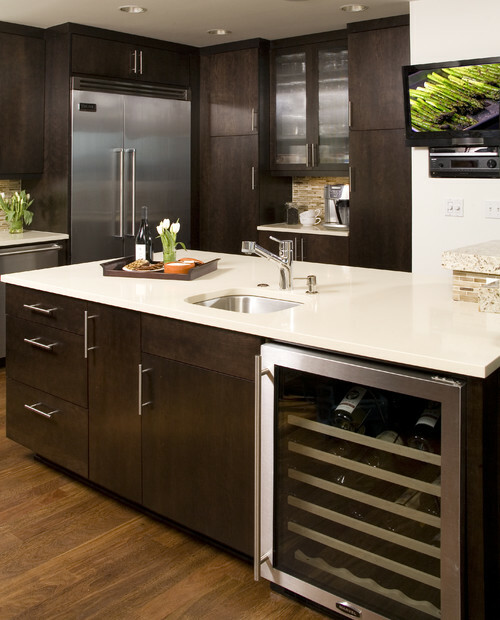 Utilizing natural maple cabinets with oversized stainless steel hardware, it defines this space as contemporary. Leather accented barstools, bull nose edge profile granite countertops and the cove crown molding surely keep it clean. These kitchens break all the rules! You can mix and match to your hearts content. Refusing to conform to society’s view of a distinct style. You can have a style that is all you. This kitchen is a combination of finishes, materials, and textures. Using contemporary details joined with a traditional tone, the natural stone and granite bring all the style home to you. Details are the true definition of a traditional style kitchen. These details whether it’s raised-panel cabinetry, decorative moldings, legs using furniture style, or arches… they all can convey the owners personal style. This kitchen uses classic raised panel cabinetry, stacked crown molding, bead board details on the island, a classic hardwood floor, furniture ends on cabinets, and an arched valance over the window. selection for balancing harmony and flexibility. 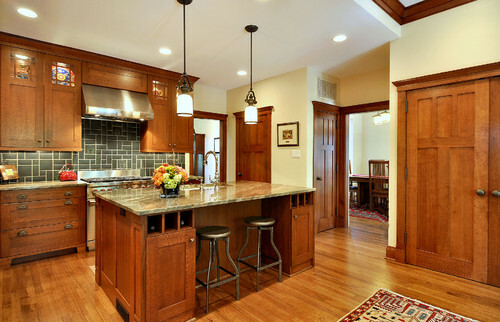 This kitchen uses glazed painted cabinetry, oil rubbed bronze hardware, hardwood flooring, and stacked crown molding. A standard canvas to springboard into others styles by decorating selections leading to a neutral backdrop and following a favorite décor. A rival to the clean white kitchens of today, rustic style is a more distressed and worn appearance incorporating stone, wood, brick, fireplaces, and more vintage appliances. This kitchen uses timber frame construction, hickory cabinetry, a stacked stone fireplace, and slate tile flooring. All components of an organic and rustic feel. Don’t be surprised if you are confused about which style best suits you. Come into the embee & son, inc. showroom and talk with one of our kitchen design experts. We can help guide you through the process of discovering the kitchen of your dreams. So, WHAT IS YOUR KITCHEN STYLE? Leave a comment, we’d love to know! A little information about embee & son, inc.
embee & son, inc. is the premier retailer in kitchen remodeling, bath remodeling, flooring, cabinetry, countertops, and home fashions in York, PA and South Central, PA.
We offer custom kitchen designers and custom bath designers on our staff to make your home remodeling a hassle-free project from start to finish. If you’re in the market for something fresh to update your home, embee & son, inc. is here to help your dreams become reality.